The hot summer months are upon us again, setting up yet another hot water scenario for catching bass. 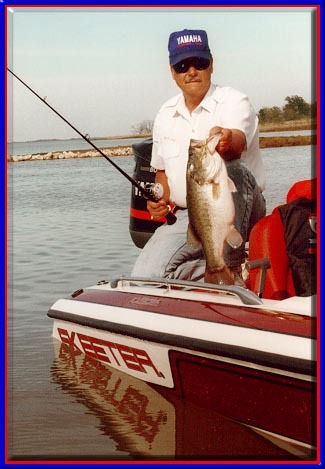 When water temperatures get hot (75 and up), the metabolism of the bass increases, resulting in more drastic mood swings than the fish experience at other times of year, The personality of the bass is therefore much different at this time of year, than say in the spring or fall when water temperatures are in the 6G’s and low 70’s. 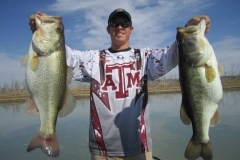 In the hot summer, bass are typically either feeding wide open, or they are totally sedentary. One for each mood of the bass. When the bass go on the prowl and they become active, fast moving reaction baits will do the trick. 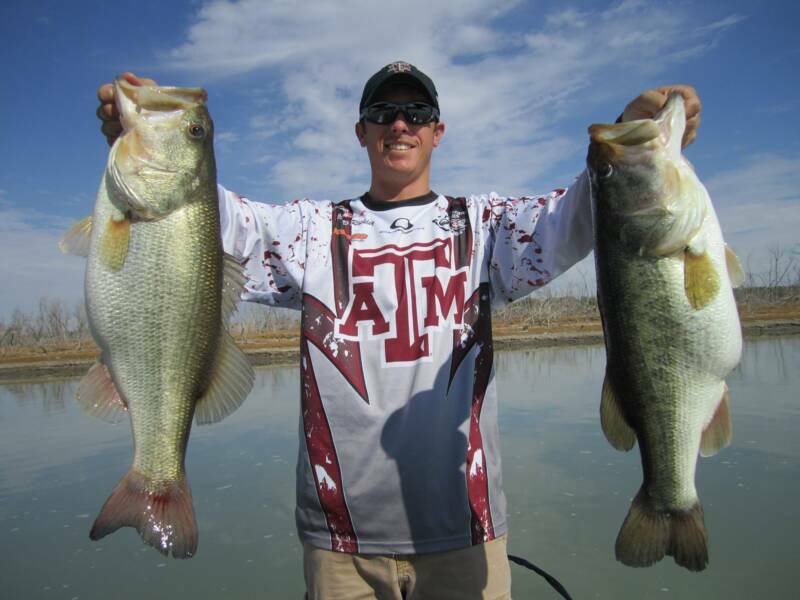 Fast moving topwater lures, crankbaits, and spinnerbaits are great choices to catch these active fish. 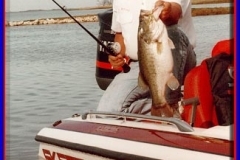 To efficiently angle for these active summer bass, the prudent fisherman will put his Motorguide Beast trolling motor on 3/4 or full speed, and cover vast amount of water looking for active bass. 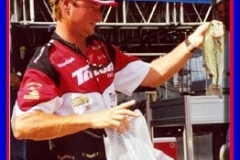 Some of my favorite bait choices for these power techniques include topwaters that can be worked fast, such as buzzbaits and small chuggers. Topwater baits such as these are most effective when fished around shallow vegetation or brush. Concentrate on main lake flats and the backs of coves, pockets or washes. Medium and deep diving crankbaits like the new Berkley Frenzy in shad patterns are another great choice for covering a lot of water in a hurry. Concentrate your crankbait 6shing on steeper rock shorelines or walls, and on windy days don’t be afraid to crank shallow brush. The Berkley Jay Yelas Power Spinnerbait in a Summer Shad pattern is another great choice for catching active shallow fish in the hot summer. Pitch this spinnerbait around shallow brush and grass, and be sure to use a fast retrieve in clear water. Retrieve the spinnerbait no deeper than 6 inches deep, and wind it fast. Windy days make for especially good spinnerbait fishing in the summer. I recently designed yet another spinnerbait for Berkley. It is called the Berkley Jay Yelas Spinvisable. I designed this spinnerbait for clear water applications, and it is an awesome spinnerbait in warm clear water. The theory behind the Spinvisable is one of trying to create an illusion to the fish. Lets face it, spinnerbaits don’t look real, and in clear water it is very easy for bass to identify a spinnerbait as unreal food. 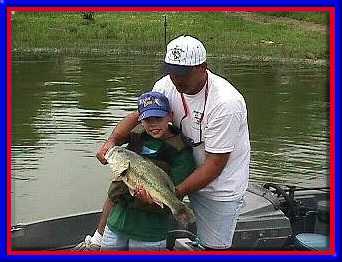 In clear water, if bass can visually lock in on a spinnerbait and identify the blades, shah, and skirt, they don’t eat it. Hence the fast retrieve, and hence the Spinvisable. This bait will revolutionize spinnerbait fishing in clear water. It wi0 be available sometime this summer. 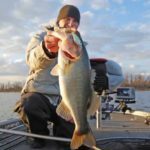 Getting back to summer bass behavior, it is therefore important to understand that during a 24 hour period, the bass have brief, wide open flurries of activity that will last for about an hour or so, then they go dormant and rest for a few hours. Bass burn up so much energy when active in hot water that, to survive, they are forced to rest for most of the day. It might help to compare the bass’ metabolism to the RPM’s of your automobile. In hot water, the bass has a high metabolism, and its RPM’s run really high when it is active and looking for food. If it stayed active like this for long, it would burn up, just like your car if it were run for too long at high RPM’s. 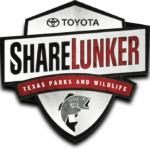 In cooler water, the bass have a lower metabolism, or lower RPM level, and they can stay active longer at these moderate levels of water temperature. So, during periods of activity for summer bass, it is a good idea to use these fast moving, (high RPM) reaction lures I’ve mentioned. Match the mood of the bass. When the bass’ mood changes, however, and they go into a resting mode, the angler must slow way down if he expects to continue catching fish. During a typical summer day, the bass are active for just a brief period of time, maybe a couple hours or so. The rest of the time they slow down and conserve energy, but they can definitely still be caught. To consistently take these inactive fish, the angler will have to switch to a worm of some sort, and fish slowly. This is why worms are the best overall summertime lures to catch bass. 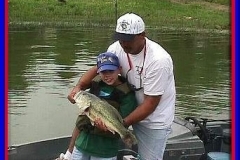 There are more hours during a summer day when a worm crawled slowly over the bottom will be more appealing to a fish than a topwater or spinnerbait worked spastically fast over the surface. I have developed so much confidence in Berkley Power Worms over the past few years, that now they are the only worms I carry with me to the tournaments I fish. 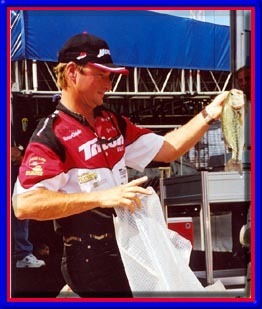 Berkley has a complete line of soft plastics to meet every worm fishing cir*****stance a fisherman might encounter. Some of my favorites are the 10″ and 7″ Power worms and the 6″ Power Zip Worm in pumpkinseed, red shad, and blue fleck. Good summertime worm fishing is typically ledge, brush, or baitfish related. 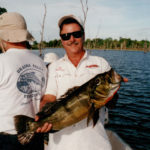 Usually the bass are found between 20 and 40 feet deep around good structure. Keeping a close eye on my Lowrance LMS-160 and my Lowrance X75 really helps me in identifying these deep structure areas. Structure varies from lake to lake, you’ll have to find the key area on each lake yourself. Look for dropoffs or ledges, brush on the edges of deep flats, or schools of shad. One good thing about these deeper summer bass is that they generally stay in the same areas for a week or two, and can be counted on as consistent producers. They are good, consistent tournament fish. Keep these ideas in mind this summer, and you’ll be on the right track. 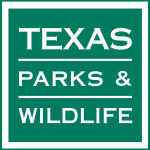 Good fishing, and please remember catch and release.